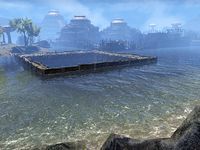 Vivec City (often shortened to simply Vivec), named after the god of the same name, was the largest city in Vvardenfell, once situated on its southern coast in a large lagoon with Baar Dau floating above. The city was a collection of nine artificial islands; each island was a separate district or canton and was made up of a large multi-tiered building the size of a small town. The many bridges and walkways between these cantons created a maze that could be intimidating for new arrivals. Water was the dominant element in the architecture, present even inside. The entire city of Vivec was considered a holy place, as it was home to the Living God Vivec himself. The city was policed by special guards drawn from the militant order of the Temple, the Ordinators. Most cantons were generally built of four tiers. The lowest, only accessible from drainage grates or trapdoors, was the Underworks, or the canton's sewer. The Underworks were located on the water-line, and were a nest for criminals, rats, and other undesirables, as Ordinators never ventured into them. Above the Underworks, at the level of the main walkways and canals, were the Canalworks, where tombs, homeless paupers, storage rooms, and a few small shops could occasionally be found. The Canalworks of a canton were generally only accessible from the upper levels, or via trapdoor from the Underworks. Above the Canalworks were the Waistworks, filled with shops, clubs, temples, and residences. The top of a canton contained a large domed courtyard known as the Plaza, with standalone buildings rather than doors built into corridor walls. Canton plazas were filled with manor-houses and fine shops, and could usually only be accessed through large doors from the exterior. All of the space within a canton had to be leased from the Temple, and the only Guards allowed to police the area were Ordinators. The first of these cantons from the Vivec landing on Vvardenfell's mainland was the Foreign Quarter, the entrance to Vivec. For many years, this was as far as outlanders were allowed into Vivec, although this law was repealed long before Vivec's destruction. The Foreign Quarter housed the Mages and Fighters Guilds, a cornerclub containing the Thieves Guild, a small Imperial Cult shrine, a tomb, and many shops. It was also the largest canton in the whole of Vivec, having two Waistworks levels, once known as the Lower and Upper Waistworks. Three of the next four cantons were under the control of the three Great Houses that had land on Vvardenfell: Hlaalu, Redoran, and Telvanni. Each of these cantons represented the wealth of each Great House, and, as one might expect, housed shops, services, and lodging for House members. The cantons also each had a small individual temple, and a large treasury, which contained numerous rare items, gems, and a significant stash of gold, all under heavy guard. The fourth of this group of cantons was the Arena, where public entertainments such as comic plays or mock battles were held, along with any duels to honorably settle conflicts of interest or advancement. All fights there were special events; there were no routinely arranged fights or tournaments in the Arena. The Arena's plaza was taken over by the vast Arena Pit itself, and below the plaza were facilities for training, equipping, and lodging arena fighters, as well as a good sized storage complex. The next two cantons were residential ones named in honor of two of the saints of the Tribunal Temple, Saint Delyn and Saint Olms. The St. Delyn Canton and St. Olms Canton provided low-cost housing to the commoners and paupers of the city, and also had nicer homes for the more affluent in their Plaza areas. Both cantons had several shops in the Waistworks, and small temples. South of these two cantons was the Temple Canton, which was unique in its construction. The Temple canton was flat atop its canalworks, which were devoted to the Halls of Wisdom and of Justice. The Hall of Wisdom contained a large library of religious books, and many low- and mid-ranking members of the Temple bureaucracy worked there. The Hall of Justice housed all of the Ordinators in the city, as well as the various offices related to Ordinator activity throughout the district. Atop these halls was the cathedral of High Fane, once home of the Archcanon of the Temple, Tholer Saryoni as well as many other high-ranking Temple members. Above it hovered the Ministry of Truth, a hollowed-out moon housing prison cells for dissidents of the Temple. 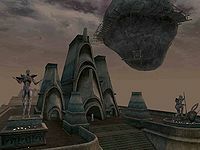 According to lore, Vivec himself stopped the moon from falling onto the city, and it was thought that it would remain hovering as long as people believe in the Tribunal. Behind the Temple canton was the Palace of Vivec, the residence of the Living God Vivec. The Palace itself was a small if grand-looking one-room affair, but it was mounted on its own canton, which is built from five levels of sewers hiding a shrine somewhere in their midst, known as the Puzzle Canal. The door to the Palace was kept locked at all times, as access is by special invitation only, and no one but the Archcanon is normally allowed to speak to Vivec himself. Vivec City was founded with the construction of the Palace canton at some point following the rise of the Tribunal. As the Palace drew more and more pilgrims who sought to pay homage to Vivec, the Temple canton was eventually built to accommodate them. 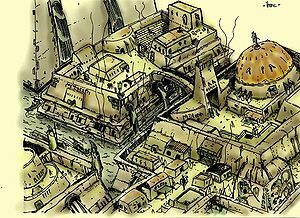 [UOL 1] The expansion of the Palace and Temple complex into a proper city began later, in the years following the Second Akaviri Invasion of 2E 572. 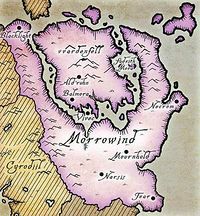 During the Three Banners War, the city was half-complete, with the St. Delyn and St. Olms cantons finished and inhabited, and the Redoran, Hlaalu, Telvanni, and Arena cantons in various stages of construction. The Foreign Quarter canton had not yet been conceived, as Morrowind maintained open borders with Skyrim and Black Marsh due to its membership in the Ebonheart Pact and outlanders were consequently tolerated in Vvardenfell. Baar Dau had also not yet been converted into the Ministry of Truth, and in fact threatened the nascent city as Vivec's power was being drained at the time by Clavicus Vile. At some point following the dissolution of the Ebonheart Pact, access to Vvardenfell and Vivec City was restricted considerably. The Foreign Quarter was built to accommodate foreign visitors to the city, who were forbidden from crossing into any of the other cantons. These restrictions had loosened by 3E 427, however, and outlanders could once again walk the streets of the entire city. In the years after Vivec's disappearance, with the Warrior-Poet no longer supporting Baar Dau, the wayward rock began resuming its previous velocity and trajectory. A soul-powered device called the Ingenium was crafted by the Dunmer with the aid of Clavicus Vile to hold Baar Dau in place, but was later destroyed. In 4E 5, recorded by the Dunmer as the Red Year, Baar Dau finished its long-delayed journey. It collided with and destroyed Vivec City, and the force of the impact triggered the eruption of Red Mountain. The area where Vivec's awe-inspiring cantons stood has since become known as Scathing Bay, because the rock opened up a fissure into an active underwater volcano. This page was last modified on 9 November 2018, at 12:26.